Let’s look at the common scenario where you track goals with events. This could be a contact form submission, newsletter subscription, phone number click or other type of interaction where you don’t have a distinct URL to use for destination URL in GA goals settings. You can have the form / link on multiple pages on your site and you want to understand which page a visitor was on when they completed the conversion. This is the list we want – almost 40% of the users who clicked the Live Chat button were on the home page, and another 30% were on contact-us and rooms pages. 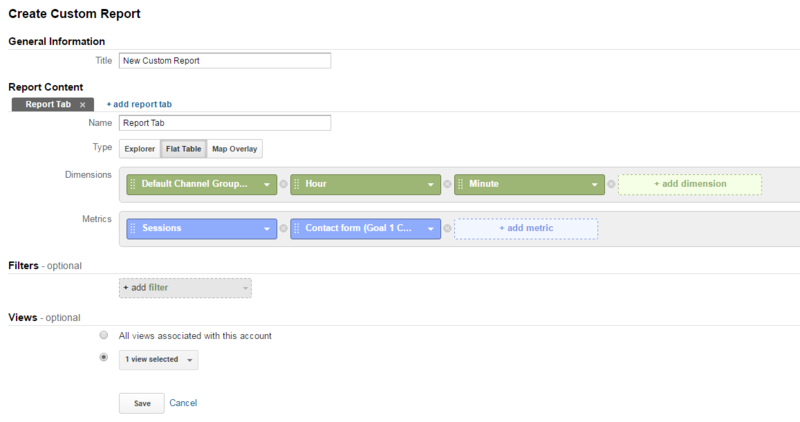 You can export the list and group the pages or analyze further. Google Analytics shows you quite a lot of things about your traffic in its standard reports – what sources and locations visitors are coming from, what pages they land on, how long they stay, do they convert, etc. But there’s no standard report to show the time people are entering the website. You can only see a graph by hour in the Audence Overview report if you select the Hourly tab and a shorter time range to avoid sampling. There are Hour and Minute dimensions in GA that we can use to apply to any report. Let’s see at what hour most people are coming to our site by traffic channels: go to Acquisition -> All Traffic -> Channels report and apply secondary dimension hour. Now you can see the specific time of day when people entered your site – an easy way to discover how your links shared on social media or press release announcements are affecting traffic. Here Avinash explains what’s an ad block and offers a tracking code change through Google Tag Manager or directly together with setting the custom dimensions and segments in Google Analytics. The last part shows 5 reports and KPIs that deliver critical insights from ad blocking behavior. If you’re concerned about your customers using ad blockers, this is the way to understand its impact. Inspired by the heatmap feature in the redesigned GA Mobile App, the Analytics Team at Seer built a Google sheet that you can save in your account which allows you to heatmap certain metrics to identify growing or hot trends over time. It’s really cool, so check it out with your data! Simo’s blog is again featured 2 times this month. This first one is a guest post by Dan Wilkerson from LunaMetrics about the document.write() method used in the Google Tag Manager Custom HTML tags. It explains the problems with having document.write in your 3rd party marketing tags and the proper way to run them in GTM. If you need to easily implement a roll-up GA property with exact hit duplication, this plugin that Simo developed can help. The implementation is straightforward and is recommended to use it with on-page Universal Analytics tracking, not with Google Tag Manager. Google announced a free version of Data Studio for individuals and smaller teams and you can access it at http://google.com/analytics/data-studio There are a couple of videos about it in the GA Youtube channel and it looks great! You can connect all your marketing data (GA, AdWords, Google Sheets, BigQuery and soon SQL databases to access first party data) and turn that data into beautiful, informative reports that are easy to understand, share (like Google Docs), and fully customizable.